Sure, try saying all that three times quickly. Esoctrilihum is an esoteric French act wedged pretty firmly between the black and death metal mediums, with pronounced elements of both that tend to dominate different sequences of their songwriting. The first time through this album I was so blown away by the intro piece...a harrowing, mesmerizing swell of dark ambiance, rumbling percussion and almost a martial/industrial feel that I was actually disappointed when they busted out into the metal material. 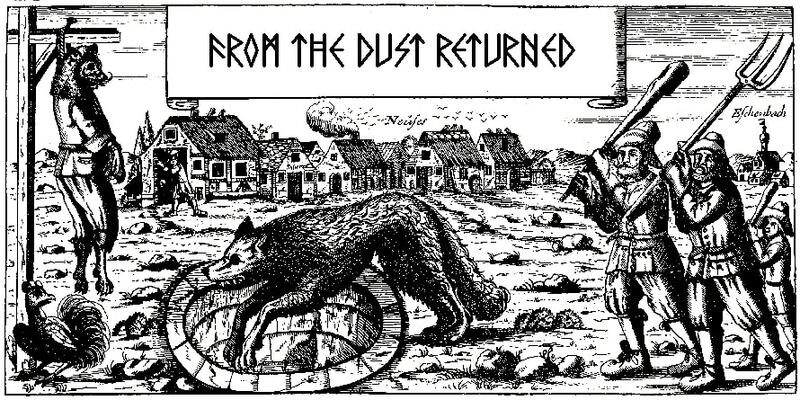 As I let the dust settle, however, it became apparent that they were capable of just as hypnotic material when they're battering away at the harsher end, if not quite so eloquent or enchanting to the ear. Pandaemorthium, whatever the heck that means, is a record so steeped in its atmospherics that it seems the remainder of the content is only quite so good as it lives up to that goal. 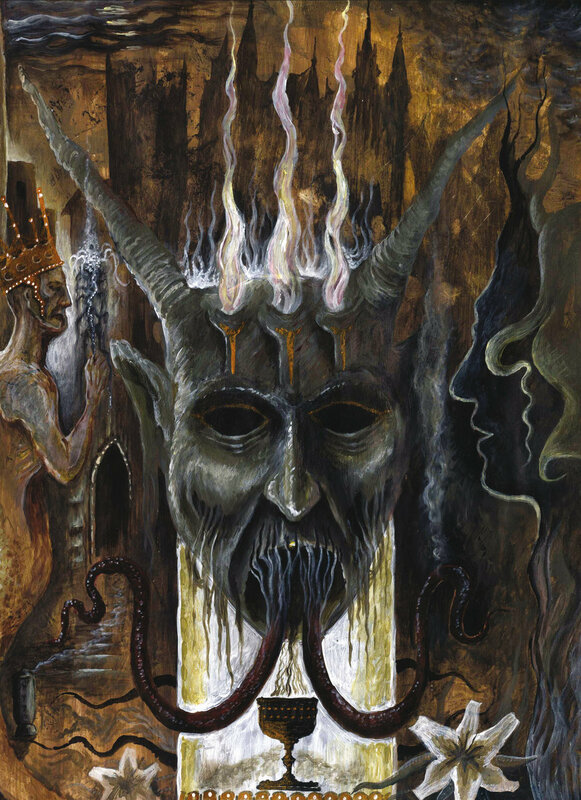 Although I've largely seen the band labeled as black metal, this to me feels like an expansive, subterranean brand of death which is interspersed with more dissonant, higher pitched tremolo picking streams that steer it more into the aforementioned genre. The vocals are gigantic, rumbled gutturals which dominate the mix as if there were seismic activity and each lyric was a stalactite being dislodged from the vaulted roofs of the underdark. The guitars exist on two planes, the first being a percussive, ceaseless tirade of chugging riffs which served as a substrate for all the soily, haunting musical components above them. Almost as if they were being used as a backup to the already intense volleys of blasting and double bass drums. Higher strings on the guitar are used more like these droning, insectile flurries that draw the ears from the pummeling subtext, and then above that you've got the wish and wash of ambient atmospheres created by the vocals and effects. Every now and then they'll burst into some murky, mid-paced blackish riff where a melody will thread below the growls and in a few spots, almost creates an early 90s, raw and cathartic Hellenic black metal feel to it which might have appeared on the earlier Rotting Christ full-lengths. But in truth, while they mostly stick to the styles I've described, Esoctrilihum are anything but predictable, since the album is suffused with these ugly, evil segues. The structure of a lot of the rhythm guitars resembles archaic death/thrash with a rubble-strewn mix to them, an oblique tone which feels both primordial and ugly until the more fulfilling vocals are splayed across it. You don't know exactly what is going to lie beyond each dark, twisted corridor of the band's imagination, even though when you take a few steps back and see the album as a whole, it's rather consistent. When they bust out a lush, tranquil piece like "Breath of the Silent Shape", with its half-yawned and half chanted vocals (also appearing elsewhere), I am taken aback at how all this grotesqueness suddenly channels itself to something beautiful, like discovering some rare strain of lotus that grows only deep beneath the surface crust of the world...poisonous but entrancing. An eclectic, interesting band, yet another on the ever-expanding roster of I, Voidhanger, which manages to distinguish itself from a lot of its own avant-garde French peers and offer something on its own. I'd certainly recommend this one to fans of morbid Canadian bands like Mitochondrion or Antediluvian, or other filthy black/death hybrids who put their atmosphere at the forefront of priorities. Nearly 70 minutes of grumbling, oozing submergence into the depths of occult, earthen horror.